One day, King Herod took out his sword and killed Jesus’ apostle James. When he saw that this made the Jews very happy, he went ahead to arrest Peter and locked him up in the prison. King Herod had sent many soldiers to guard Peter until the day he will show him to the Jews. While Peter was locked up at the prison, the church prayed for him. On the day before King Herod will bring Peter before the Jews, Peter was sleeping. He was bound with two chains on his hands. Suddenly, an angel appeared. A lightning struck the side of Peter and the shackles were broken off. 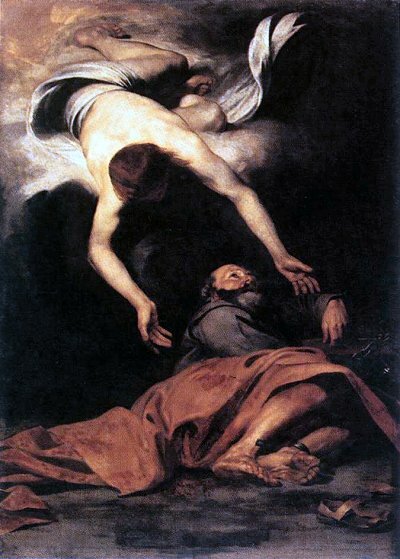 The angel said to Peter,”Get up quickly!” Peter did not know what was happening. He thought he was seeing a vision. Peter followed the angel. When they came to the prison’s gate, the prison’s gate opened itself and he passed the gate of the prison and got out. Then he realized that he wasn’t seeing a vision. Then Peter came to house of Mary where many people had assembled to pray. Peter knocked at the door and a girl called Rhoda opened the door. Rhoda was shocked to see Peter and she went and told them. They did not believe what Rhoda said. But Peter kept on knocking on the door and when they open the door, they were shocked. They thanked God that He had delivered Peter out of the prison. Peter then left them and went to Caesarea. The next morning, King Herod found out that Peter was gone and nowhere to be found. He examined his guards but he still couldn’t find Peter. So King Herod killed all his guards. The people were very angry with King Herod. They protested against King Herod and had Blastus to be on their side. On a day, King Herod sat down on a throne before them. But the people kept protesting and shouting at him. While King Herod was sitting on his throne, an angel killed King Herod. King Herod died and his body was eaten by worms.